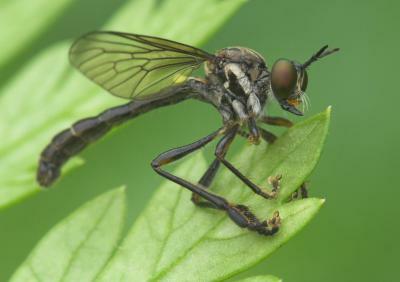 Dioctria atricapilla (Violet Black-legged Robberfly) is usually a distinctive species, being generally darker and more robust than other species in this genus. The blue or green eye colour of live individuals is also a good clue. However, the recording scheme sometimes receives photos of dark-legged Dioctria individuals that don't look right for atricapilla, and I think at least some of these are dark-legged forms of D. hyalipennis (= D. baumhaueri) (Stripe-legged Robberfly). D. atricapilla has darker hairs behind the eyes than D. hyalipennis does (and male D. atricapilla has dark bristles forming its 'moustache'). D. atricapilla also has darker bristles on its legs than D. hyalipennis does. But a more definitive difference is in the amount of silver dusting on the sides of the thorax. In D. atricapilla the silver dust-stripe does not meet up with the base of the mid coxa, whereas in D. hyalipennis the silver dust-stripe continues down to meet the base of the mid coxa. I would be interested to hear from anyone else as to how consistent the hair colours are on the head and legs of these two species, especially in the females. The photo below is by Tim Worfolk and shows a Dioctria specimen with fairly dark legs, but the silver dust-stripe clearly shows that it is D. hyalipennis rather than D. atricapilla. I've seen one or two D. hyalipennis with even darker legs.